Over two summers, Rick Bragg sat by Jerry Lee Lewis’ bed, where Lewis, in his late seventies, was mostly immobile, in pain, suffering from shingles, systemic infections, pneumonia, a compound fracture of the leg that wouldn’t heal, and crippling arthritis, tended to by his seventh wife, Judith. After a lifetime of alcohol, barbiturates, amphetamines, and thousands of one-night stands with his band and strange women, it was a wonder he was alive at all, but The Killer, a nickname earned in the sixth grade, his last year of schooling, was surviving and unrepentant. Lewis believes he may have made enemies: the bedroom door is “reinforced with steel bars.” He has a “loaded, long-barreled pistol behind a pillow,” a “small arsenal” in a dresser drawer and “a compact automatic on a bedside table.” But Lewis avows he fears no man. These days he fears only the judgment of God, and continues seriously a debate with himself that he, years ago, had with Elvis: to wit: does singing rock and roll condemn a person to hell, a Hell that was perfectly real in the Assembly of God in which Lewis was raised in Depression-era Louisiana. Lewis’ cousin, Jimmy Swaggart, made a fortune condemning Jerry Lee’s rock and roll from his corrupt pulpit, but despite his fear Lewis believes, sincerely, his music, his talent, all of it comes from God. Where else? “Barely five years old” he played—really played—the first piano he sat at. There were no lessons. As millions know, Lewis is a wild man, “a meteorite, a stampede,” the ultimate crowd pleaser, a savant playing, one is told, perfectly, with fingers, elbows, feet and buttocks. Refusing to be followed on stage by anyone, he famously performed encore after encore and then set the piano on fire with gasoline as Chuck Berry waited to go on stage. Bragg follows Lewis through his ups and downs—ups being monster hits like “Great Balls of Fire” and “Whole Lotta Shakin’ Goin’ On,” which made him very rich, sometimes earning ten thousand per night. There were unavoidable horrors such as the deaths of two sons and of his parents Mamie and Elmo, along with a rich variety of self-inflicted wounds: near-fatal addiction, much-deserved bankruptcy and IRS troubles. His marriage to his third cousin, thirteen-year-old Myra, tanked Lewis’ career for a while but really, what was all the fuss? In Ferriday, Louisiana, girls often married at thirteen or fourteen and a huge percentage of the town was related. Bragg writes of Lewis buying and wrecking, one after another, Rolls Royces, Corvettes (“wrecked a dozen of em”) or Cadillacs (also a dozen, in one year), and miraculously walking away, unhurt and unarrested. One night he drove drunk into the gates at Graceland by accident and, although he had been invited, he was arrested. There is a mug shot. Near the end of his days, Lewis is reflective but not repentant. About his marriages (some bigamous), other women, drinking, drugs, violence, meanness, whatever, he says repeatedly, “I did what I wanted…. If I wanted to do something, I just did it.” And he “ain’t no phony.” He never pretended to be other than he was. This biography is a brilliant piece of work. Make no mistake: not only is Rick Bragg the right man for this job, with blue-collar empathy in the marrow of his bones, he is the only writer who could have done it. The prose is rich in metaphor, often poetic, but never cloying. One is not being persuaded to “like” Lewis: that would be impossible and in bad taste. 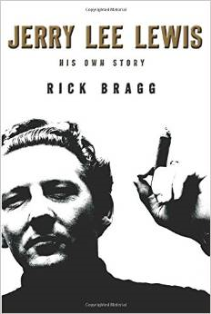 Bragg makes one FEEL Jerry Lee, his genius, his ecstasy, his pain, his violent, seemingly uncomprehending relationship to the twentieth century.